Welcome! to the Power of Proof newsletter from Surety! Here you will read about latest news in data integrity protection, from intellectual property and digital evidence, to electronic record authenticity. 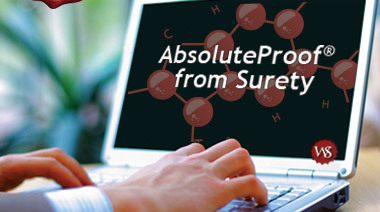 Surety's AbsoluteProof family of data integrity protection solutions help protect and legally defend your organization's most critical electronic research and lab data. We welcome feedback about the content provided at info@surety.com. Most of us spend more hours than we care to admit online, surfing webpages for everything from professional networking and email, to dinner recipes to back-to-school shopping, and yes, even guilty pleasure reasons such as celebrity gossip. But what happens when you find out the webpages you're visiting aren't secure — putting your personal privacy at risk? That's an issue that Google is facing today. News reports suggest that some security certificates given to Gmail users earlier this year, assuring visitors that the website was protected from hackers and spies, are in fact fake and inaccurate. Reportedly, the signatures issued from the certificate authority (CA), DigiNotar, are not authentic, nor are they supported by Google. The company is still investigating the issue, but in the meantime, we thought the topic was worth sharing, especially as this problem continues to occur with various CAs. Privacy concerns exist in all forms and fashions...not just in electronic documents, but online interactions as well. Keyless integrity protection controls, such as AbsoluteProof, are crucial in our digital lives, as truth and ownership hinges solely upon authenticity. Make your online experience safe and secure, and protect your web content today. Listen to leading industry experts, Surety customers and product team members as they discuss data integrity protection best practices and how authentication is the key to safeguarding electronic records. Learn more about how Surety is uniquely positioned to help you address your requirements for protecting and defending your electronic records and other digital content. Download Surety's intellectual property resources or visit the intellectual property blog, Power of Proof. Visit our Resources page or check out our Power of Proof blog. Sponsorship: Workshop B: "Ensuring the Legality of Your IP"
Summary: It's often legally admissible to bring conversations, postings and messages from social networks into courtroom debates. Protect yourself and your organization by capturing what's being said about you. Founded in 1994 by prominent Bellcore scientists, Surety is a recognized, trusted time-stamp authority, and leading provider of IP protection solutions for R&D-centric industries. With millions of electronic-based scientific records, files and other digital content worldwide protected under its authenticity seal, AbsoluteProof ensures against content tampering by providing a “digital wax seal” for all types of electronically stored content, enabling legally-defensible proof of authenticity, time-of-creation and ownership of original material. View a short overview webmovie here. Visit us online at www.surety.com.